LOS ANGELES, Calif. /California Newswire/ — As Californians face the annual April 15th tax filing deadline, it is important for taxpayers to remember how simple it can be to make a contribution to one or more worthwhile causes while completing their state tax return. California is one of 41 states that allow taxpayers to make a voluntary, tax-deductible contribution in the “Contributions” section of their state tax return. Since 1984, California’s tax check-off program (Checkoff California) has raised $85 million and provided critical funding to a diverse range of public health, social service, and environmental protection programs. The fifteen funds participating in California’s tax check-off program are: Alzheimer’s Disease/Related Disorders Fund, California Breast Cancer Research Fund, California Firefighters’ Memorial Fund, California Military Family Relief Fund, California Fund for Senior Citizens, California Peace Officers’ Memorial Fund, California Sea Otter Fund, California Seniors Special Fund, California State Children’s Trust Fund, Rare and Endangered Species Prevention, Emergency Food Assistance Program, California Ovarian Cancer Research Fund, Municipal Shelter Spay-Neuter Fund, California Cancer Research Fund, and ALS/Lou Gehrig’s Disease Research Fund. 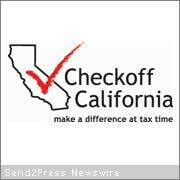 The annual Checkoff California media campaign, now in its third year, reaches out to taxpayers and tax preparers to deliver the message that, regardless of income, everyone can help. Media partners include the Northern California Broadcasters Association, Southern California Broadcasters Association, and the San Diego Radio Broadcasters Association. Corporate sponsorship of Checkoff California is provided for the third consecutive year by Jackson Hewitt Tax Service, an industry leader providing full service individual, federal, and state income tax preparation nationwide, with more than 300 locations throughout California.